The Burning Coal theater has 4,000 flexible square feet, 140-175 seat state-of-the-art theatre with balcony on three sides. Located in Raleigh, North Carolina, Burning Coal Theatre is an innovative entertainment venue and a non-profit organization. It offers its visitors a unique experience by producing literate, visceral, and affective theatre. Burning Coat Theatre employs the best local, national and international artists, and it hosts overlooked classics, and contemporary plays addressing poignant issues in the community. It’s a member of the Theatre Communication Group, and it works with AEA and non-equity actors alike. For your convenience, you can buy a subscription for the current season or get individual tickets. Military discounts and gift certificates are also available. Check the venue’s website to find more information about current main stage shows and second stage shows. A reviewer, who parked nearby the theatre, says that he attended an improv night and that it was one of the best nights of his life. He says that he hasn’t laughed so hard for a long time and that the ticket price is modest in comparison to what you get. The reviewer mentions that Burning Coal Theater looks amazing on the inside and the outside and that it has comfortable seats. Moreover, the venue has a big parking lot so it won’t be an issue to find an available He concludes that Burning Coal Theatre is worth visiting if you’re in Raleigh, North Carolina. Another show fan, who was staying in a hotel nearby, observes that the theatre is small, but it offers incredible, intimate atmosphere thanks to its black box layout. She adds that the room is visually stunning and well-lit. In addition to this, it has great sightlines and a small balcony section. The reviewer also shares that there were M&Ms and pretzels during the intermission and that she was delighted with the performance and the sound. Another live entertainment fan, who was flying to Raleigh, North Carolina to meet a friend, states that he visited the Burning Coal Theatre and was left speechless after the end of the performance. The reviewer shares that all the seats have an excellent view of the stage and that the actors and the choreography are amazing. Another visitor observes that Burning Coal Theatre offers a variety of shows to suit any taste. It has local comedies, high-school performances, and breathtaking shows. The reviewer says that Burning Coal Theater never disappoints with unprofessional productions and that their shows always entertain and provoke you. 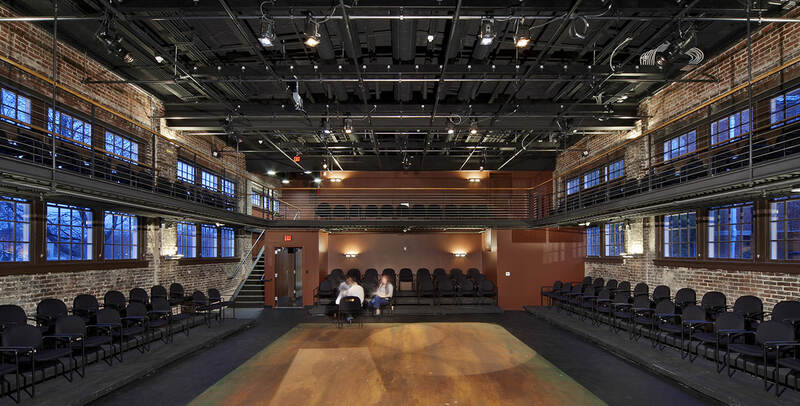 A theatre fan comments that Burning Coal Theatre is a hidden gem in Raleigh, North Carolina and that you must visit it if you like thoughtful He also mentions that the staff is attentive and friendly and that you can grab a bite from a nearby restaurant before the show. Another reviewer shares that he is amazed by the creativity of Burning Coal Theatre’s actors and that you’re so close to the performers that you feel like a part of the play. He recommends that you see some of the second stage shows because they’re more provocative and entertaining than the main stage ones. The ticket purchaser remarks that there is a big parking lot available for no charge and a refreshment area. You can also buy some souvenirs and books.